Click here for a recap of the women's players to watch in 2014. Novak Djokovic has been the best hard-court player in the world this decade, winning three Australian Open titles (2011-13) and playing in the final of four consecutive US Opens (2010-13). The big winner of the fall hard-court swing – the 2014 Wimbledon champion swept the titles in Indian Wells and Miami – has also been a consistent performer in the Series, taking the title in 2012 and finishing in the Top 5 of the final Series standings in five of the last six years. None of the top contenders will play in more Series events than John Isner, who competed in all but Winston-Salem, N.C., in 2013 en route to his third consecutive Top 3 Series finish. The 6-foot-9 American also has experienced great success on the summer circuit, winning at least one Series tournament title each of the last three years, and reaching six finals in that span. Isner also enters the summer playing solid tennis; his fourth-round showing at the French Open and third-round performance at Wimbledon marked career bests. 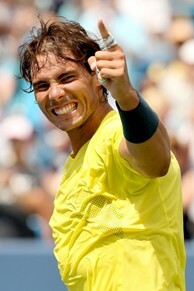 Rafael Nadal was dominant last summer, taking titles in Montreal, Cincinnati and at the US Open. The 2014 French Open champion has not been as good this year as last, but he and Djokovic remain the two elite players in the men’s game. Moreover, the Spaniard has posted solid results on hard courts in 2014, reaching the Australian Open and Sony Open finals. He has also reached the final at the US Open the last three times he has played, with two titles, and he and Andy Roddick are the only two-time men’s Series champions. Long hailed as the next great men’s tennis player, Grigor Dimitrov has begun to deliver on that promise in 2014. The 23-year-old Bulgarian made runs this year to the semifinals at Wimbledon and the quarterfinals at the Australian Open. He has also demonstrated his versatility, winning titles on hard courts (Acapulco), clay (Bucharest) and grass (Queen’s) – all of which means the transition to the summer hard-court season should be no issue. A strong 2014, which included a run to the Wimbledon final, a semifinal showing at the Australian Open and a victory in Dubai, has vaulted 2007 Series champion Roger Federer back into the Top 4 and puts him firmly in the mix for a second Series crown in 2014. Overall, he has finished in the Top 5 of the Series standings on six occasions, and his five US Open men’s singles titles are tied with Jimmy Connors and Pete Sampras for the most in the Open era. The 2010 Series champion and the runner-up in 2008 and 2009, Andy Murray has established himself as one of the elite hard-court players in the world. And while he has not yet played his best tennis this year in returning from 2013 back surgery, the 2012 US Open champion has typically fared well in Series events, having won twice each in Cincinnati and the Rogers Cup in Canada. Milos Raonic last year became the first native Canadian to reach the final at the Rogers Cup since the Series’ inception. He has continued his rise in 2014, advancing to the French Open quarterfinals and the Wimbledon semifinals to cement his place in the world’s Top 10. Like Isner, he should benefit from playing close to home – he finished fourth in last year’s Series standings – and on his most familiar surface – all five of his career ATP titles have come on hard courts. The 2013 US Open semifinalist and the champion at the Australian Open and Monte Carlo in 2014, Stanislas Wawrinka has vaulted himself into the conversation as one of the best players in the world. Surprisingly, the world No. 3, who also reached the quarterfinals at Wimbledon and opened the year with a title on hard courts in Chennai, has never finished in the Top 5 in the Series standings. He seems a solid pick to change that in 2014. Kevin Anderson is another tall player with a big serve who excels on cement. Last summer, the South Africa-born, Florida resident reached the final of the Series event in Atlanta and the quarterfinals at the Series stop in Washington, D.C. And back in 2011, he recorded his first career Top 5 win by defeating Murray in the second round in Montreal. Alexandr Dolgopolov has been the biggest riser in the Top 50 this year, ascending to No. 19 behind wins over Nadal, Wawrinka and David Ferrer. He is another player who has done well in the Series in the past, winning his first hard-court title in 2012 in Washington, D.C., and advancing to the semifinals in Winston-Salem a year ago. Kei Nishikori has quietly had one of the better seasons of any men's player in 2014, winning in Memphis and Barcelona to briefly crack the Top 10. Hard courts have traditionally been Nishikori’s best surface, and he has competed in each of the five men's Series events at least once in the last three years, increasing his chances of a Top 3 finish in 2014. Sam Querrey has slipped outside the Top 50, but he is a former Series champion (2009) and Top 20 player who excels on hard courts. His game also seems to be rounding into shape; the California native reached the semifinals at Eastbourne, and he pushed Jo-Wilfried Tsonga to 14-12 in the fifth set at Wimbledon. Plus, three of his seven career tour titles have come in Series events.